Thank you for the opportunity to comment on the Santa Susana Mountains Trails Master Plan – Phase II Project (SSMTMP-PII). The SSMTMP-PII is also important to me as an environmental investigative journalist who has covered issues related to the Santa Susana Field Laboratory (SSFL) and its surroundings since 1998. This work has appeared in newspapers and magazines as well as existing in its entirety on www.EnviroReporter.com of which I am publisher and lead reporter. My comments concern Phase II.b and the proposed John Luker Trail which is located primarily in Dayton Canyon west of the San Fernando Valley in the foothills of the Santa Monica Mountains. These comments are backed up with source material, much of it my own which has been fact-checked and published over the years in such publications as Los Angeles magazine, LA Weekly, Ventura County Reporter, Los Angeles CityBeat & ValleyBeat and other publications. 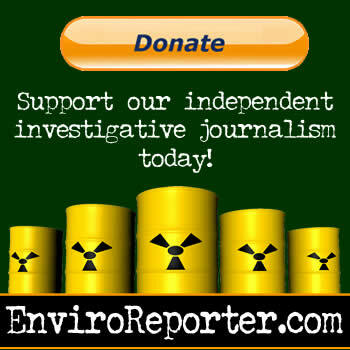 All of my material from this 19 years of reporting now resides on EnviroReporter.com as we approach our third decade of SSFL-related journalism. I do not have endnotes for your documents of the SSMTMP-PII as you already possess that material and are assumed to be familiar with it. 1. Plans to open existing Dayton Canyon-area (DC) “social trails” and the proposed trail that, in draft form, is called the “John Luker Trail” (JLT), should not be opened until completion of a full cleanup of SSFL. 2. All DC, Bell Canyon and Woolsey Canyon trail heads and staging areas should have warning signs to alert trail users of the potential dangers of chemicals in the soil, dust and water, much like the real estate warning given to nearby residents of the dangers of SSFL when property is purchased in the area. 3. The proposed “John Luker Trail” has been tentatively named for a controversial public figure without input from the public, the majority of which would object to this person being so honored after his long record of public slander, libel, racism and homophobia, all of which are document herein, as it does not conform to the standards of decency that the County of Los Angeles (County) represents. The JLT needs to be renamed or not named at all. Much of Phase II.b and Dayton Canyon (Project Area) border and/or are downhill from Area I of SSFL which is grossly polluted. Much of this contamination has migrated down through the Project Area via effluent runoff in Dayton Canyon Creek and through dust and dirt migration to lower elevations. Impediments to a full cleanup of SSFL, exposed in this article, make trail blazing in Dayton Canyon up to the SSFL property line premature and potentially hazardous to the trail blazers and subsequent users of the trail. One video shows heavy machinery in Area I of the lab roaring around destroying and grading the last of what once was the Instrument and Equipment Laboratories or IEL complex. Huge clouds of dust are launched into the air landing on any SSFL subcontractors and full-time lab workers that may have been in the area as well as drifting towards the San Fernando Valley. Most of the contaminated dust falls out on hills that drain down Happy Valley above Chatsworth into Dayton Canyon Creek and finally the Los Angeles River. A Centex consultant detected the rocket-fuel ingredient at levels as high as 62,000 parts per million in the sediment along Dayton Canyon Creek, about 1 1/2 miles from the lab. It would not be prudent or fiscally wise to open or build trails in the effluent zone of SSFL contamination on the east side of the lab until the site is completely cleaned up. A specific provision should be inserted in the SSMTMP-PII that the Phase II.b project area trails will not be opened and/or developed until the lab is fully cleaned up as demanded by the Los Angeles Board of Supervisors. Every person who buys a home near SSFL is warned of the potential dangers. It has not been found to have had any measured negative effect on property values or the area’s reputation. The same holds true for warning signs for Phase II.b project area trails because otherwise the trail user will have no idea that so much highly toxic contamination has impacted the area immediately uphill. Once the provisions of Comment 1 are met with SSFL totally cleaned up in accordance with the wishes expressed in the Los Angeles Board of Supervisors’ letter of April 5, 2017, then trail openings and building will only then commence. Each one of the 4 (four) Phase II.b project area trailheads and 5 (five) staging facilities should have warning signs. These signs should match other signs there and advise trail users that they are libel for anything that transpires on the land. The signs should also explicitly state that the trails are next to and/or connect to SSFL which leaked chemical contamination, including trichloroethylene and perchlorate, off the lab. A significant number of people in Los Angeles that I am aware of who care about SSFL and SSFL-related issues that didn’t know about the SSMTMP-PII were outraged when they found out that there was a 4.5-mile-long set of trails to be named the “John Luker Trail” (or JLT). You may receive comments from them at the last minute as are mine. I only found out about the SSMTMP-PII and the Phase II.b project area three days ago. How this JLT idea came to fruition without awareness of Luker’s history is mystifying as any john luker ssfl Google searchx would show. There on the first page of the search is a Sep 1, 2016 EnviroReporter.com article called Dept. of Energy secretly funding front group to sabotage its own Santa Susana Field Lab cleanupxi and a December 12, 2012 piece entitled Operation Astoturfxii. Luker’s say-anything-mean-nothing Trumpian hucksterism is bewildering even to the seasoned CAG observer. Oft times appearing disturbed to this reporter who listened to the August 17 CAG meeting via a cell phone set on a chair by Bonnie Klea, Luker would periodically shout at the phone assuming that this reporter was on it, calling me “Mikey” at one point amidst rants detailing his lobbying efforts which have included State Senator Fran Pavley (D-District 27). True to form, though, the truth inevitably tumbles from one of DOE’s new grant recipients including Luker himself. By the end of the meeting, he became more introspective speaking to no one in particular. “I find myself falling into these fallacies and it’s really easy to,” Luker said quietly. “It’s really easy to attack [this reporter] instead of the data and that’s one of the big problems I have with this stuff. Now one of the big problems many in the SSFL community have, myself included, is the County actually naming a trail after Luker. The 2012 Operation Astroturf article detailed Luker’s public metamorphosis from cleanup advocate to a greenwashing astroturfer hell-bent on destroying the cleanup. A similar DTSC scoping meeting took place in Simi Valley December 14 , attracting more improbable anti-cleanup tales along with insults. “Most of the people talking here today are just ranting and raving,” said John C. Luker III. That certainly did not describe people such as Arline Matthews, who lost a son to a radiation-related cancer she thinks could have been caused by manmade radiation at Rocketdyne. Granted, a person is allowed to have his or her opinions, but when that person is quietly given the honor of a to-be-constructed 4.5 mile long trail named after that person, they should at least not be given to wild insults, homophobic jokes and libel on various public platforms such as Facebook. John Luker has done all this and in the SSMTMP-PII the JLT seems a fait accompli with no public input. That would be an outrage. But without providing you this oft-times distasteful information, the Planning Division and the Board of Supervisors would not have enough facts in hand to make a considered decision to remove Luker’s name from any trail or other feature within the project area. Hence, more facts for you folks to consider. Granted that an anti-gay joke isn’t that serious; what is serious is the County naming a trail after the man who made it. 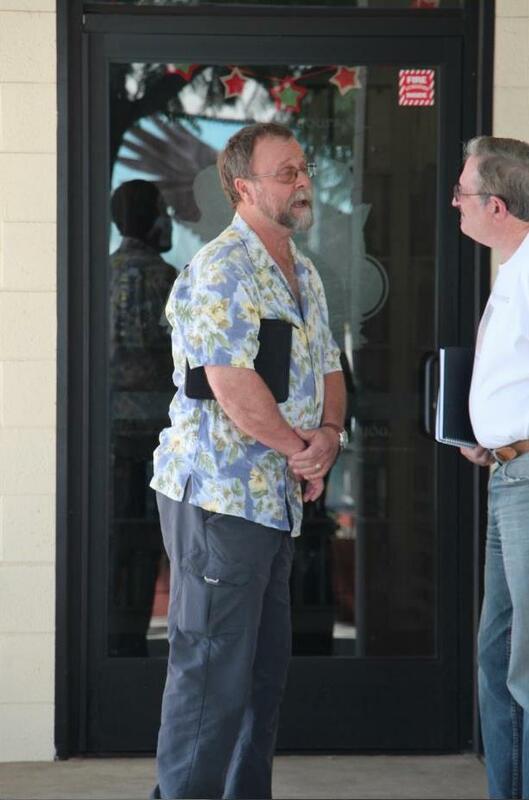 Would the Chair of the County Board of Supervisors countenance such a decision? At least the public will have one last chance to ask her if the JLT name isn’t changed or dropped before final approval of the SSMTMP-PII. 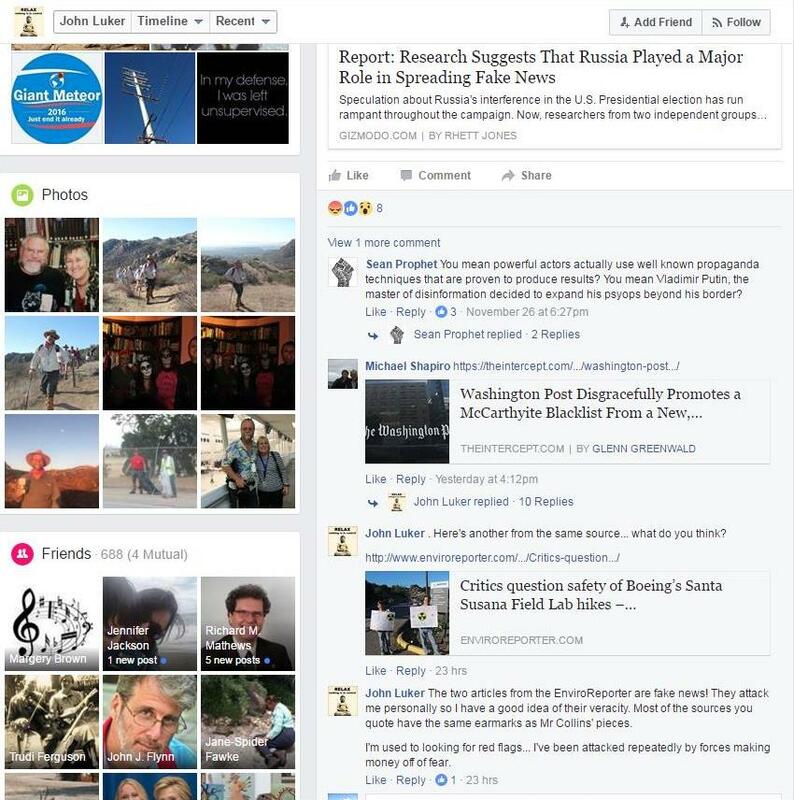 John Luker-The two articles from the EnviroReporter are fake news! They attack me personally so I have a good idea of their veracity. Most of the sources you quote have the same earmarks as Mr Collins’ pieces. 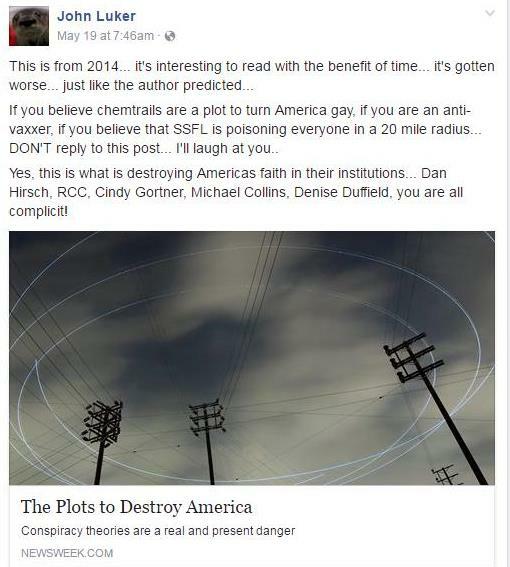 “If you believe chemtrails are a plot to turn America gay, if you are an anti-vaxxer, if you believe that SSFL is poisoning everyone in a 20 mile radius… DON’T reply to this post… I’ll laugh at you. Luker’s latest attempt to disrupt a public event in an effort to smear pro-cleanup residents reached a zenith, even for him, at a public meeting of DTSC to discuss the Programmatic Environmental Impact Report for SSFL in Chatsworth October 7, 2017 which I attended and witnessedxx. Luker told a DTSC public participation person that a woman at the meeting was harassing him and to call the police. Two LAPD units quickly arrived, interviewed Luker, the woman and the DTSC person and found no problem. They told Luker to leave as the best solution. Luker left but not without disrupting the event and adding a sense of trepidation into the proceedings. SSFL will never get cleaned up. There is an atmosphere of hatred and conflict that has been stirred up by people who are making a very good living off NOT cleaning this place up. Dan Hirsch, Denise Duffield, Michael Collins, Consumer Watchdog and PSRLA all have a financial and political interest in keeping this level of anger and, now, violence, at a fever pitch. There is NO way a reasoned, logical, civil discussion can take place. The only danger John Luker is in is the possibility he’ll be sued for these kinds of libelous remarks. The real danger the community faces is if Luker’s anti-cleanup cabal succeeds in derailing the cleanup of the old Rocketdyne lab. Adding his name to a trail does not seem like wise policy and should be reversed. 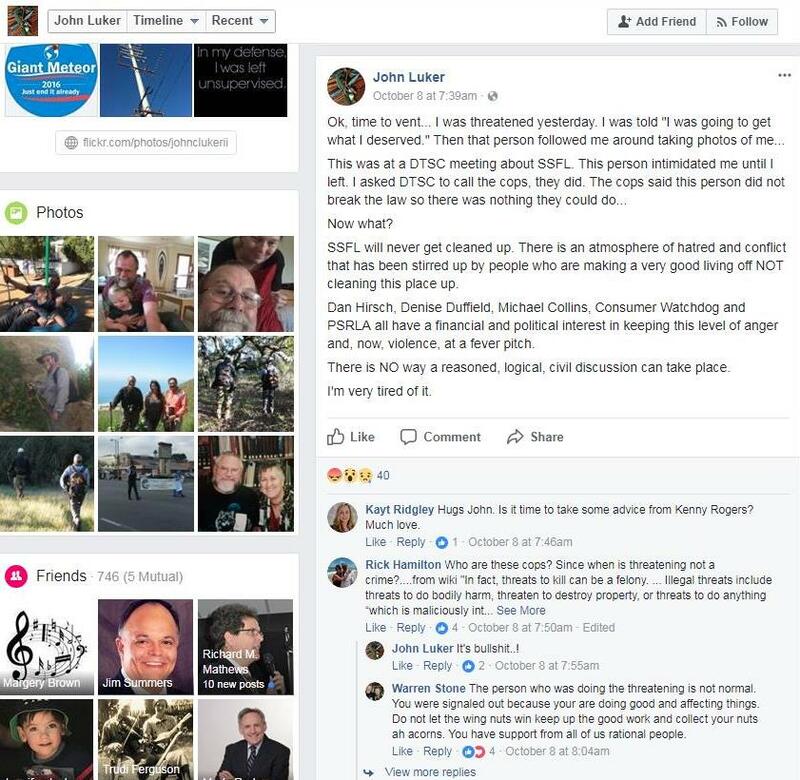 Under the SSMTMP-PII “Project Objectives” it says “Develop a plan consistent with relevant County plans and policies.” Naming a prospective trail after John Luker is not consistent with the policies of the County against defamation, racism and homophobia. Under the SSMTMP-PII “Benefits of Trails Master Planning” it says “Attract or obtain funding for trail development and/or maintenance” I assert that naming a prospective trail after as controversial a public figure as John Luker will hurt attempts to get funding for anything having to do with him. Luker has publicly harassed this reporter, my wife and community members including mothers with children with rare cancers like leukemia calling them “screaming harpies.” His behavior is contrary to standards of public decency. I have reported on and witnessed this person behaving and acting in a manner that I do not believe reflects the values of this county for nearly a decade. Naming a trail after Luker would be a travesty once you consider the information presented here. It would be an insult to not only the mothers of children stricken with rare illnesses they blame on SSFL, but to the people who have fought for decades for SSFL cleanup and, not the least, to the County of Los Angeles as well. Thank you again for this opportunity to comment on the SSMTMP-PII.